For most of us, life itself is stressful. Even if you are not facing one large stress, the sum of your responsibilities can be more than enough to cause anxiety. How can prayer make a difference? Let’s find out. Did you ever stop to wonder why we worry so much? Imagine if you were someone’s pet. Would you worry about where your next meal was going to come from? Do we see pet dogs pacing back and forth thinking, “I wonder if my owner is going to feed me tomorrow?” In many ways, our worry comes from how we perceive situations. The famous psychiatrist Carl Jung said that even scientific study is a symptom of how our minds work. Ironically, we worry because we know too much. We can think abstractly and imagine what could go wrong. Being fully conscious, the danger and unpredictability of life make us cringe. Even though it’s wise to be prudent, excessive worry doesn’t help. For most of us reading this article, the major problems that might face human beings are not present in our lives. Things like food, shelter and clothing are probably not missing from your life. What if my son/daughter does not graduate from high school? What if today my child does not eat for the third day in a row? If the difference is so easy to understand, why do our smaller worries take on such big proportions? The devil’s power works only if you believe his lies. In the stress of everyday life, Satan wants you to believe that your problems are much bigger than they really are. But he doesn’t stop there. He also wants you to believe that if you worry enough and work hard enough that your problems will go away. In this way he generates the thing he desires more than anything else: fear in your heart. And the last thing in the world the enemy wants you to do is get on your knees to trust God in prayer. 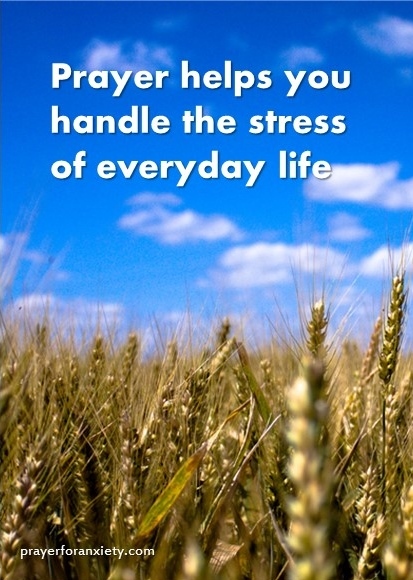 It’s hard to pray when you are busy and overwhelmed. Many times we have to force ourselves to pray. You might be thinking, “But if God is love and mercy, why does he want me to struggle to pray?” Because in this way he builds your character, and a strong character casts out fear. We want fast, concrete answers to problems, that is, we want the easy way out. We don’t want to have to venture into uncertainty to find the solution. But our consciousness reminds us that the universe is full of uncertainty, so in our worry we fight against the entire universe. Only by invoking God can we hope to be victorious in this struggle. When you stop to pray, you enter into God’s presence. Even though it may not happen immediately, with time and practice, prayer will show you the greatness of God. His majesty is revealed to you, and your worry fades away as God becomes the center of your life. Sometimes we misunderstand this to think that following God means ignoring your worldly responsibilities. Instead it means that your experience takes on the right perspective giving you order and clarity. When God is at the center, we see things in the light of truth. If God gives you the gift of life each day, then how can he not be at the center of your existence? This truth gives us the right mind to be free of fear. Even our greatest fear – the fear of death – is fully addressed when we contemplate the resurrection of Jesus Christ. So when you pray, give praise to God. Praise him for who and what he is – the Creator of the universe. Thank him for your life. Gain the confidence that dispels worry and fear. Let all your troubles out in his presence. Tell him everything that bothers you and takes away your peace. Then take it all and place it in the wounded side of Jesus – giving it up to God’s grace. Our search for concrete answers is a never ending process. Only God gives you an answer that is eternal and unchanging. His answer is love. I have to go on retirement in June ’19. I am a widow and do not know how I will survive without my job income. I am looking after my aged mother who has cancer and I do not have anyone else to support me. I am worried sick. Oh dear Trudy… I’m so sorry to hear about your situation. Of course you are worried, who wouldn’t be? Is there any way you can look for another job… maybe part time? Send your prayers to God. He will help you! I will be praying for you and your mother. Amen Malcolm! I totally agree! In Jesus’s name, Amen. your will be done. I am so very thankful each and every day I wake up thank you God for being here for and my love one’s thank you God for your love. Amen! Thank you God! Thank you Jesus Christ! I just love this Prayer for Anxiety site, because I suffer with that disease. With reading all the messages and prAyers, it really helps me to understand all that I am going thru and knowing that there is only one person who understands and who I can count on for help, and that is GOD. I thank you for this site. God Bless all who suffer from this terrible disease. Thank you so much for leaving your words of kindness and encouragement. We all need God, especially those who suffer from anxiety. Many blessings to you!